Emotions are contagious! Parents can catch strong emotions in their children alerting them to cues of their feelings without a word expressed. Parents catch a feeling from their child such as seeing fear or anger in a facial expression. People's feelings powerfully spread to each other beneath our awareness due to massive neural networks in our brains. 1. According to Daniel Goleman, author of Social Intelligence, emotions pass sometimes through a "low road" that is fast but not always accurate. We sometimes react quickly and later regret our decisions. 2. According to Goleman, emotions also may pass through a "high road" that is slower, more mindful, wary, and observant. Parents are better off using this high road which is what I call "Stepping Back" when using Parental Intelligence after you view an unwanted behavior. It gives you time to take in your reactions and think before you act. When we are looking at our child whose face reveals a strong emotion like disgust, pleasure, sadness or indifference, our facial muscles begin to mirror the child's facial expression. This automatic imitation allows us to be influenced emotionally giving us a chance to be empathic with our child. It's not unlike watching a movie and seeing an expression on a character's face that makes you want to laugh or cry. If someone held up a mirror to your face at that moment, you might be astonished to see you are imitating the actor's expression. Moods are very contagious so that even a fleeting glimpse of a grin or a frown affects us. Our radar is stimulated like an early warning system of something to come. We catch subtle pauses as well. When someone lies, they usually pause for a bit of a second before answering a question. We pick this up and become suspicious without realizing why. We catch their tell-tale emotion in that pause. Empathy is sensing the emotion of your child. It's physiological and psychological. Parents catch on to the inner states of their children the better they know them. 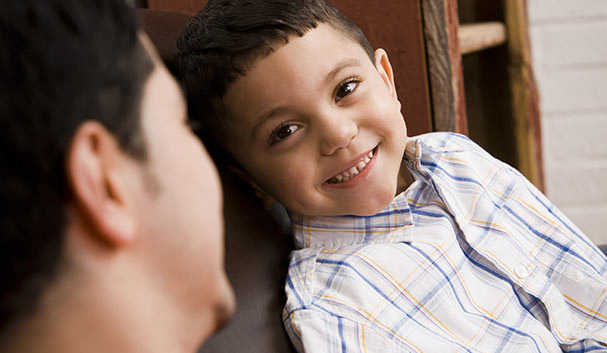 This is the step of using Parental Intelligence called "Understanding Your Child's Mind." The parent who is the empathizer begins to share the state of mind of the child if he or she is attuned to their son or daughter. The child, in turn, senses the feelings of the parent. And so, the cycle continues. Catching your child's emotions is very helpful to effective parenting, especially parents who use Parental Intelligence. It gives you the opportunity to step back and reflect on both your feelings and your child's feelings before reacting too quickly to something you may not understand. With Parental Intelligence, you wait and learn the meaning behind these emotional states that are so easily passed between you and your child and then turn to words to find out what's going on. Emotional contagion eventually can lead to constructive problem solving and the strengthening of parent-child bonds. Laurie Hollman, Ph.D., is the author of a new book, Unlocking Parental Intelligence: Finding Meaning in Your Child's Behavior, found on Amazon, Barnes & Noble, Familius and wherever books are sold.